The Sabres simply cannot defend. Even when the defense corps plays a sound game – which you could technically define tonight as – the forwards are invisible defensively. Not to point the finger at one player, but Cody Hodgson was not only wandering in the corner on the penalty kill that led to Erik Karlsson’s goal but he also made a crucial error on the play that led to Daniel Alfredsson’s goal in the first period. While Hodgson has been a revelation as a number one center this season, his defensive play has been lackluster. Of course, the Sabres don’t have many options when it comes to who is going to be playing center in defensive situations. Granted, Enroth should have stopped the second goal this evening and probably had a good shot at the third. Yet watching the game it was clear that there were still chances being allowed that many of the league’s most efficient defensive teams aren’t allowing. 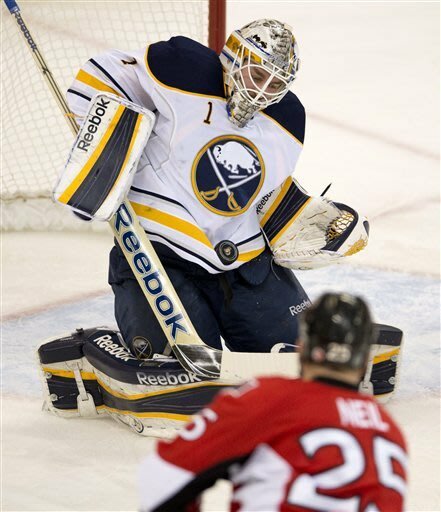 While there is no true silver lining to be found with yet another loss, the Sabres were able to lock down a bit in the third period and Enroth showed some confidence in between the pipes. That, combined with the late scoring surge showed that maybe there are some signs of life from the club. Tyler Myers and the rest of the defensive corps was far less of a tire fire than in past games. Myers took a poor angle to the puck carrier (yet again) on Ottawa’s winning goal, but he was noticeably less awful throughout the course of the evening. I liked Adam Pardy’s game. He was physical and steady. He ended up with a tough minus on the winning goal as there was no support from the forwards while Chris Neil cruised in for the goal. In many ways I liked Pardy more than what Alex Sulzer has brought in a strictly defensive role. It may be worthwhile to keep Pardy up especially if his presence continues to improve the defensive zone coverage. Once again, it doesn’t matter who is in net if the Sabres give up open opportunities like they did on the Neil and Alfredsson goals. These are the type of plays that cause games to hinge upon a goaltender getting a shutout or allowing just one goal. Expecting that over the course of a season – or even 10 to 15 games – is beyond unrealistic. While re-signing Jochen Hecht seemed like a good decision, he hasn’t brought all that much defensively from what I’ve seen. Maybe it is because he is playing in more of a scoring role, but I don’t think much of what his impact has been so far. For what it’s worth, the Sabres forwards have all been well below par when it comes to defensive play. Good on the HPV Line for their continued success. Count the Sabres as 0-1-0 when Thomas Vanek doesn’t record a point. Hodgson is really looking like a number one center, especially skating between Vanek and Pominville; both the Sabres and Canucks got quite a bit out of this trade but I certainly think the Sabres addressed a serious need and Hodgson has been living up to the potential they saw in him. It still seems like some of the puzzle pieces of the puzzle aren’t fitting together for this team. Maybe a trade would help, but there are certainly talented players all throughout the roster, but they’re not all providing the necessary punch.